The 401(k) Saga-Don’t do This! Financial professionals frequently suggest rolling over your 401(k) into an IRA when you leave a job. The down side of leaving your retirement account with the old employer means you’re subject to their fee structure and investment options. 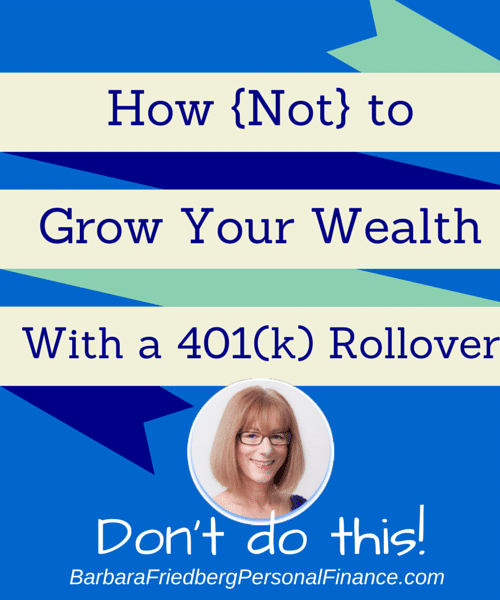 If you rollover your 401(k) into an IRA-you gain control! You choose; where to house your money. Already have an account with Schwab, Fidelity, Vanguard, ETrade or another discount broker? You can transfer the funds into the same company. You may make money rolling over your account. We got a $600 bonus from the discount broker when I transferred my husband’s old 401(k) into a new discount broker. Make sure to ask, these types of benefits may not be widely advertised. What investments to choose? If you like ETFs, you can buy them for the account. Prefer low cost index mutual funds? Choose whichever variety you prefer. You can control costs buy purchasing a low cost product. There may be fees when you leave the former company 401(k). Some holdings may need to be liquidated before you can transfer them out. There’s some paperwork and oversight, and you must make sure to do a ‘custodian to custodian’ rollover to avoid taxes and early withdrawal penalties. We (okay, I) make a mistake in rolling over my husband’s 401(k) into a Roth IRA when he left his last job. In 2011 my husband switched jobs. We moved across country, from Pennsylvania to California. If the stress of a cross country move wasn’t enough, we sold our house too fast and so had 3 months with nowhere to go before our new house in California was slated to be available. So, those 3 months in Mom and Dad’s basement were the beginning of a big new adventure. We had a lot to do and I didn’t worry about the Pennsylvania employer 401(k). It was invested well and there was no urgency to do anything. Eventually, we moved to California, got settled and I was looking to coordinate our finances. Thus began the rollover process, sometime in 2012. I pride my self in my savvy investing strategy, including keeping fees low and asset allocation updated. We had existing accounts at a discount broker, who also offed $600 for the transfer. Everything seemed easy enough. I decided to sell our Mid-Cap Stock Index fund in the existing 401(k). I can’t remember the exact reason. It’s possible that the 401(k) management company required the sale before transfer, or this fund wasn’t in our current asset asset allocation plan. Whatever the reason, this fund had grown to a nice sum, and we sold it while it was in the old 401(k) and then transferred the cash into the new IRA. Now, here’s the issue. How do I invest the sizable proceeds of the liquidated Mid-Cap Stock Index fund? In 2012, during the rollover, the stock market had increased substantially since the recession lows of 2008 and 2009. And I was cautious. I feared we were ready for a market correction. Here’s what I did with the proceeds of the rollover, I invested about half in funds in accord with our family’s asset allocation, and I left the rest in cash. I was scared that we were due for a correction and I didn’t take my own advice-stay invested in your preferred asset allocation regardless of market conditions. I incorrectly assumed that after the correction, I could reinvest the remaining rollover monies at a lower cost in the near future. That’s what’s wrong with trying to predict the markets. Instead of a correction, we’ve seen a steady market increase from 2009 until the present. The money that wasn’t reinvested after the rollover earned about 0.01% sitting in cash. Whereas the funds that were immediately reinvested in stock index funds more than doubled in value. That is why you don’t want to time the markets and try to predict the future. You’re better off investing at market peaks while holding the investments over the long term than avoiding the investment markets totally. Ben Carlson of A Wealth of Common Sense had a great story about a guy who only invested at the market peaks, and nevertheless ended up a millionaire. What Not to do With a 401(k) Rollover? Long term, market timers are rarely winners! Winning with investing is really quite simple. Invest regularly in low cost mutual or exchange traded funds. Keep investing through market peaks and valleys. This attempt at trying to time the markets led to lost returns and a hard earned lesson. The more complex strategies and frequent buying and selling, rarely lead to out-performance. In fact, research has shown that the more frequently one trades in and out of the markets, the worse their returns. Don’t let your mind sabotage your money.